This study examined the structure and content of attitudes toward affirmative action programs, including preferential hiring based on gender or minority group status. Ninety-seven individuals recruited from the community (51 women, 43 men, 3 of unspecified gender), were presented with 70 statements obtained in a telephone survey of attitudes toward affirmative action programs. They sorted the statements on an 11-point scale ranging from -5 (least like my point of view) to +5 (most like my point of view). The Q sorts were factor analyzed using principal components analysis with varimax rotation. Three interpretable factors emerged. Factor 1 was defined by 15 women and 28 men. The group expressed strong negative reactions to affirmative action programs, focusing mainly on qualifications and merit of candidates. Factor 2 was defined by 22 women and 6 men. In contrast to the first group, participants on this factor were in favor of affirmative action programs, a position that appeared to be based on recognition of inequality in the work place and the need for change. Finally, Factor 3 was defined by 7 women and 6 men, whose attitudes seemed to be based primarily on the denial of disadvantage. Despite the fact that affirmative action policies have been in effect for as long as 30 years, only a relatively small proportion of respondents appeared to understand the need for and goals of these policies. Results of this research provide new insights and a basis for work to change misconceptions about affirmative action. 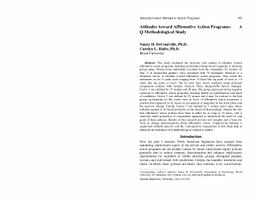 Comparisons between a single-item attitude measure and the 3 perspectives represented in this study help to illustrate the usefulness of Q methodology in subjective studies.